Hi there! You can also find me on Pinterest! Above is a photo from our recent vacation in Sedona, Arizona. There is a place called Buddha Beach where you can witness in awe thousands of stacked rock sculptures near a Vortex site at the Red Rock Crossing in Sedona. It was amazing! I love Sedona! I am loving the fall color palette and accessories over at Eileen Fisher! Check out all of the deep toned scarves and sweaters! Also, if you are a business woman just starting out, you can apply for the 2010 Eileen Fisher Business Grant Program for Women Entrepreneurs! Do you love the Helvetica font? Are you a color fanatic and can spout this year's Pantone color of the year? Or are you just in need of some color therapy? If so, book your flight to Brussels, Belgium and stay at the first ever Pantone Hotel. Wowsers! I want to stay there and have a meeting there too! Although I probably wouldn't be able to turn my brain off and end up reciting pantone numbers in my sleep. Brings back memories of when I was heavily involved in apparel design. I'm smitten with another fantastic Asian inspired wedding blog called Smitten by Weddings created by Carmen Weddings, a wedding planner in the UK that specializes in Chinese Weddings! This find was brought to my attention by Wedding Nouveau, thanks Fri! As you know, I love event design and wedding style that is culturally inspired! Today I discovered Kim Liu and her gorgeous new blog about Asian Inspired Weddings! 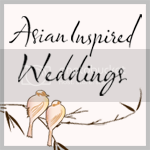 Check it out for some modern and chic ideas for weddings with Asian flair. Also, for more cultural flavor, be sure to visit my other favorite Wedding Nouveau. I'm loving this palette! 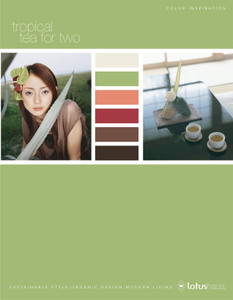 Download the Pantone Color Report for 2010 here and get inspired! Check out these jaw-dropping inspiration boards by Nay-K of Creative Lounge! Oyster Pearl Grey and Bright Colors! I'm so inspired by this lovely color combination of grey and bright pop colors for a fall wedding... aren't you?! I saw this via Love and Splendor. I think this pink and green scheme for indoor/outdoor living is simply divine... add a stone Buddha, a ceramic Kuan Yin figurine or a Thai Temple house and some carved teak wood panels and I'm all set!!! Check out more stunning photos by Pierre-jean Verger. Via Desire to Inspire. I'm loving the colors and details of the Witt Istanbul Hotel Suites designed by Autoban. Check out the laser cut flowers, the pointellist styling, the organic woods and the blend of warm modernist design. I can see envision these elements as the basis for a great party or wedding theme! Via the Contemporist. Via Decor8 I learned that Amy Butler has designed a line of 100% organic cotton bedding for Welspun that will be available in June! See more photos here and a slideshow here. It's a wonderful miracle when you discover that someone you know has been honing their creative and artistic talent right under your nose! 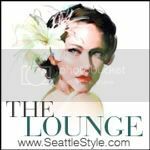 I have known Junko Yamamoto for a few years now in the Seattle event industry, but I had no idea that she was an artist! Junko will be having a solo show featuring the "Shunyata Series" at Gallery IMA during the month of June. Shunyata means "emptiness" in Sanskrit. To learn more about the inspiration for this body of work, make sure to read her artist statement... it's very inspiring! I'm definitely loving the one with the talk bubble as artwork for our nursery... the empty talk bubble is asking me "Will it be a boy or will it be a girl?" hee hee! 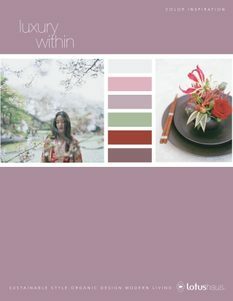 Today I was inspired by Flora Nova Design and their recent blog post letting us know that Plum is a big color for 2009. Check out their recent Plum, Cream and Chartreuse wedding! I have long loved this color combo so here is my Asian inspired version of a plum and chartreuse wedding. As a disclaimer, I usually don't post any images without linking the source, so I sincerely apologize because I don't have sources for all of these photos (boo! I know!). Please email me if you know the source. Thanks and enjoy! Photo from Organic Style Magazine; Actress Zhang Ziyi; "Origami Crane" invitation by Tiny Prints; "Brilliant Blooms" wedding invitation by WeddingPaperDivas; custom made blooming tea favor; lime bridesmaid dress; chartreuse arrangement in Chinese shallow basket; catalog photo from Smith & Hawken; pink purple arrangement in footed basket; colorful macaroons by Jin Patisserie; and decorative Black Cherry Plum soap bar by MOR Cosmetics. New Blog to Love } Jomygoodness! Sorry I've been light on the postings... I have a lot of things going on and some exciting news to share in the next month or so. In the meantime I will try to feature some of my favorite new inspirational blogs like this one! Jomygoodness is a scrumptious blog with lots of eye candy for you inspiration junkies! The author is Jomylene a fellow pinay blogger who lives in Southern California. Every Friday Jomylene does a "Week in Review" and posts a great selection of finds from other cool blogs. I'm happy to have been mentioned in a few of her reviews! Oh and I love Jomylene's color palettes! Check out this beautiful blog! Thanks to the Hostess Blog, I am now inspired for the day! Check out this fantastic red, white, and butterfly wedding from PacificWeddings.com! Holy wowness! This is an amazing bridal concept full of graphic interest and incredible technique! The designer is Moniek Vanden Berghe from Belgium and I found this photo at uBloom via Leanne Kessler of the Flower Design Institute. This bouquet with it's raffia texture and purple hues upholds the "Wanderings" Pantone trend forecast, and goes go well with my Escada inspiration board below. How many of you would be bold enough to walk down the aisle with this bouquet? I want to design for you! ...these school children captured by Ella Limbo, my energetic designer/photographer cousin who lives in Manila, Philippines and works with my aunt who owns Mode Matrix Manila, a creative services company. Check out Ella's beautiful photos at her flickr site ellafruitella! Friends, please don't worry about these kids all being in the back of a truck with no seatbelt...the school bus broke down and you gotta do what you gotta do sometimes, to get where you're going! They look like they're having a fun adventure! I trust that they arrived at school safely with much to talk about! Pantone Home & Interiors 2009 Color Forecast } "Wanderings"
Today I went to the Pacific Market Center and attended a seminar by Leatrice Easeman, the Executive Director of the Pantone Color Institute. It just so happens that Leatrice lives near Seattle, on Bainbridge Island, which is just a short ferry ride from the Seattle waterfront. During her talk, Leatrice said the color brown will not be going away (yay!) and that yellow is the new "it" color for this year. She also mentioned purple and orange as being important. The Home forecast she presented had several themes but the "Wanderings" theme captured my heart. You can watch an abbreviated version of the Color Forecast here. "The acquisition of intriguing artifacts, crafts, imagery and artwork spur the imagination and re-tells the tale of a wonderful journey. Dusky tones of rose, dijon-like yellows and deepened taupe mix with both mineral Mediterranean blues and misted gray. All shades are dramatically embellished by rich gold and scarlet red." Check this out... A colorful merchandising concept... Gap and Pantone Pop Up Store in New York on 5th Ave. Via Lintcoat. Images from Emilia Pelech/Trevor Brady, Villa Collection, W Hotel, Vital Furniture and Kråkvik & D´Orazio. Via the design savvy entertaining blog, SwankyTables, I came across these beautiful items over at LibaStyle.com. 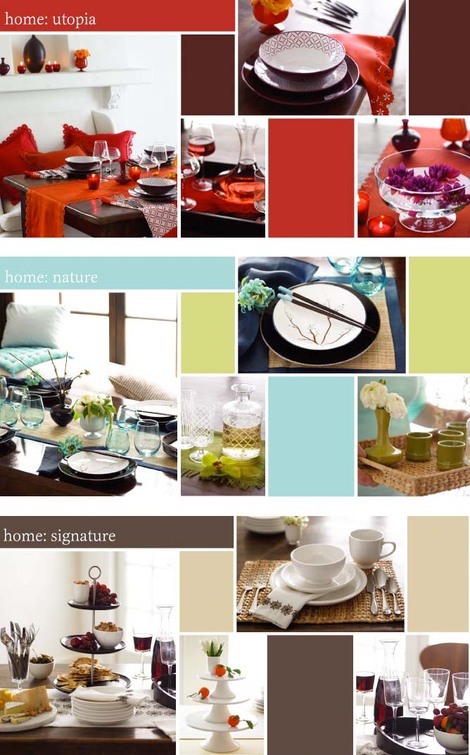 Check out the gorgeous ceramic gourd vases, colorful trays and patterned melamine platters. Lucky Koi Wall Mural } Inspiration for your Nursery and Baby Shower! Get emotional with your decor...Pick Your Mood at Stylkist, a naturally modern online decor boutique based in Mumbai, India. I love the calming colors and natural materials found at this easy to use website. Today, I'm seeking inner peace via An India Summer, one of my favorite blogs. With joy I discovered that we have some Crocosmia in the backyard...Also known as Coppertip or Falling Star, Crocosmia is a member of the Iris family and is native to South Africa. They must really enjoy summer in the Northwest, because I am seeing them in everyone's gardens! I love the red orange color and the shape of the blooms and stems. They add flair and texture to floral arrangements and remind me of the way orchids sprays look. The photos shown here are of an incredible garden design using crocosmia, the color red, and some really cool geometric walls and cut-outs - from the 2007 Royal Horticulture Society Flower Show in the UK. Check out the panorama of the garden here. For your next party invitation, try using Wordle to create graphic imagery using your own words or word clouds from your favorite blog! Above is the Wordle I created by punching in my blog address...it's fun! 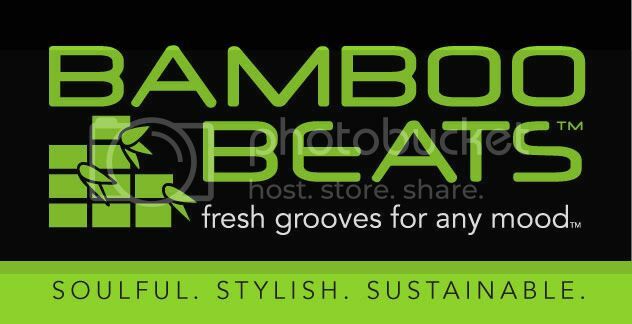 Via the event design blog Mix Mingle Glow. Check out these beautiful hand colored photographs by flickr user Okinawa Soba! Also check out these color palettes over at Color Lovers inspired by one of the sets featuring Geisha in swimwear fashion. Housemartin reminded me to check out the latest selections from Habitat...I'm so glad I did! These images are inspiring! This Mondo Collection by Rosanna (Seattle) would have been perfect for my Green 4th of July party...but that's ok, these would work for any day of the year! These lovely dessert plates and mugs are part Taj Majal, part Bali, part Mediterranean and totally beautiful. The Mondo glassware is also global, modern and green - each set is hand made and decorated by Mexican artisans from completely recycled materials! Enter to win a Rosanna Shopping Spree via The Hostess Blog. Today I'm inspired by the idea of eco-travel in Africa...Here's what I found on my web safari hunt... khaki trouser suit by Stella McCartney | floral sculpture by Junko Miura | mango wood vases by LA-Decor | bamboo cloud chandelier by Roost | lace horses by Viva Terra | sustainable sectional sofa by RC Green | Stockholm leaf chair by Ikea | and pillows by Inhabitat. Growing up with Ikat & Batik textiles all around the house (like runners, placemats, bags, sarongs) has instilled in me a sense of awe and amazement of the weavers and community of craftspeople that instinctively create the colors and intricate handwork that affords us these wonderful textiles. For me, no matter what the season, global culture and craft will always be in style. Ikat fashion spread via InStyle Magazine. Look what I put together on Polyvore, a cool site for collecting and collaging fashion and accessories from around the web! Register and download the bookmarklet, then when you surf you can "clip" images and add them to your "scrapbook". With simple drag and drop functions, you can create your own trend board in minutes (or hours if you get hooked)! I call this one Asian Gold Lacquer - inspired by the Japanese Gold Leaf painting in the background. (I added my own border in another program). You can see a few other of my collages here. Inspired by our favorite flower, this stylized Peony Pop print by Shanghai Tang is colorful, inspiring and sophisticated! 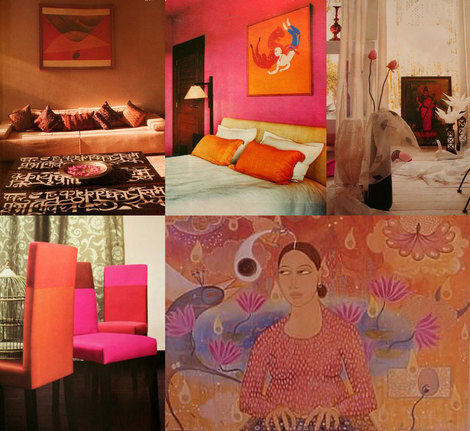 Portico India } Global Fashion for Your Boudoir! Today I discovered Stylekist, a fabulous design and decor blog from Mumbai, India! I also discovered Portico India, a most sumptuous home textile company with some amazing collections! Shown below are selections from the fashionable Urban Monk line. I love the intense colors, the artwork and the styling. Portico collaborated with the Lakme Fashion Week (would love to attend someday!) in India this spring to create an amazing fashion collection using their Urban Monk textiles. Go to the Portico site and click on the Lakme Fashion Week image to learn more about the collaboration and to watch the incredibly inspiring fashion show! Um, hello, I'll take all of those fashion pieces along with the coordinating bedding!!! I'm gettin' love and color therapy from these beautiful handcrafted ceramics from Bison Homewares in Australia! Via Style Files. These colorful tiered bento-style lunchboxes and tableware from Graham & Green make me want to party outside! These are from the UK but click here to purchase similar lunchboxes in the US. I drove by the Escada boutique and was inspired by the window display. 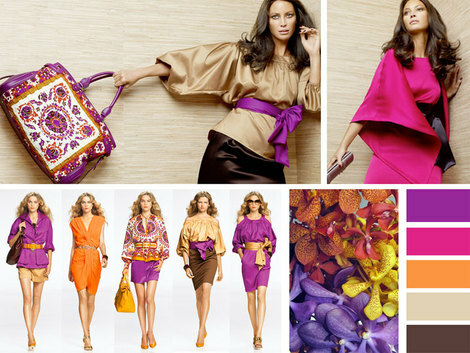 I just love the color story for the Summer 2008 collection. With saturated brights and sophistication, this palette of purple, fuschia, orange, caramel and chocolate would be an amazing color theme for a wedding, shower or special event. Next to the color pegs, you will see some beautiful Mokara Orchids that could be used to carry this theme. For you event planners and DIY brides, check out FiftyFlowers.com for bulk flowers, DIY flower combos and wholesale prices. They even carry organic roses. Gerbera daisies come in these lush colors as well! Flip through Organic Style magazine and read about B&H Flowers an amazing organic gerbera daisy farm in California. Make sure to watch the cool video tour on pg 37. P.S. Christy Turlington looks gorgeous in this ad campaign (did you know her mother was Salvadoran?)! She's simply stunning! Via the fabulous Hostess Blog, I have discovered MiGistyle. A lifestyle design company from two former Martha Stewart Living editors/designers, Michelle Adams and Gia Russo. They design great lifestyle product, create beautiful books and have many multimedia shows about entertaining. Swoon! They are so inspiring! Of course you can guess that I LOVE the Utopia collection! 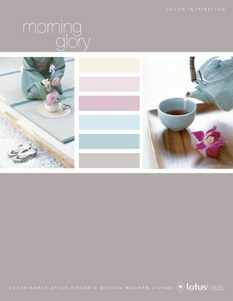 While reflecting on this past year, I wanted to share with you some color inspiration boards that I did a while ago...they make me want to slow down and be still in preparation for the new year. Go here for some floral inspiration and to center yourself. Each year I release myself from the holiday madness by watching others go crazy. 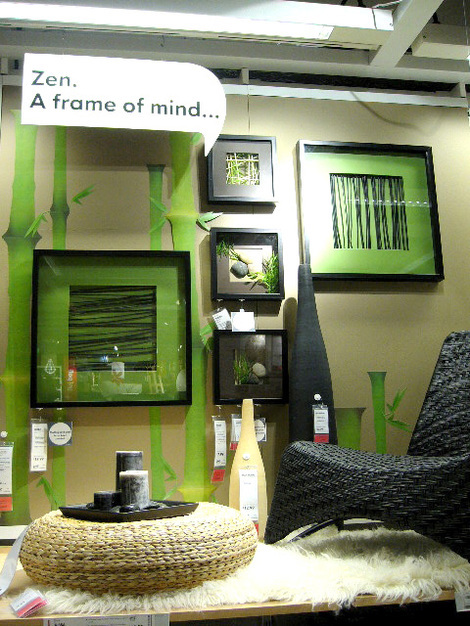 While shopping at Ikea recently, I was relieved to see this lovely Zen inspired display in the framing section. 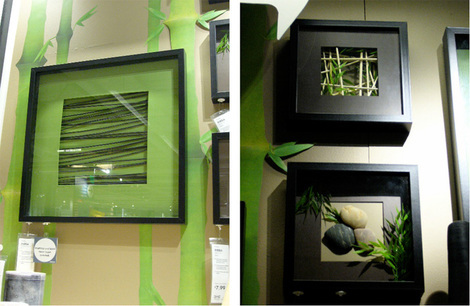 I love the fresh green and black scheme of this vignette and how easily you could DIY. Sticks and stones...shadow boxes and hot glue! I'm such a merchandising and display stalker! Window shopping is the best shopping ever - because it's free!!! Wouldn't this be an interesting Christmas theme? The smaller presence of red (just the red hangtags poking out) makes this so refreshing and modern! Hmmm, maybe I will try this next year (got no energy this year - I'm just adding gold and silver to my chocolate and persimmon Thanksgiving decor to make it work - saw this at Ikea too!). 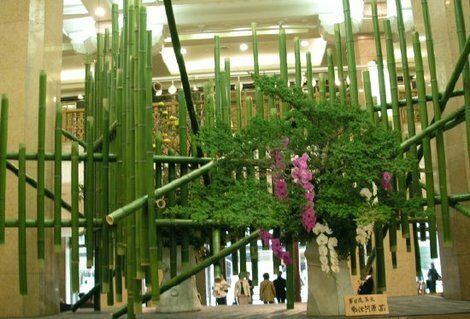 And to make the Zen Christmas theme uber modern and globally inspired, I would love to try a large scale ikebana sculpture in lieu of a Christmas tree, using green bamboo poles. Below are some inspirations. 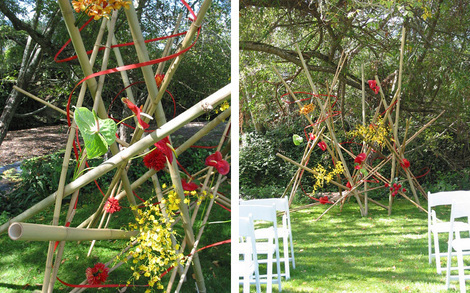 Free form Ikebana style wedding ceremony sculpture by the amazing Waterlily Pond Floral Design studio. The lovely blog Rang Decor from India has done it again! Please check out this fabulous "Pink For The Cure" post in honor of Breast Cancer Awareness Month! This is one of my most favorite blogs! Just say green and you indicate the eco-consciousness that's pervading our lives and our styles. The darling of a more environmentally aware Hollywood, green is on its way to a starring role as the newest “neutral” color. When used as a subtle backdrop to reflect environmentalism and social responsibility, this cool hue represents the growing environmental movement. Mid-tones of fern, palm, pine and sage used alone or with clear blue or aqua create living spaces that conjure a sense of outdoor-friendly living. 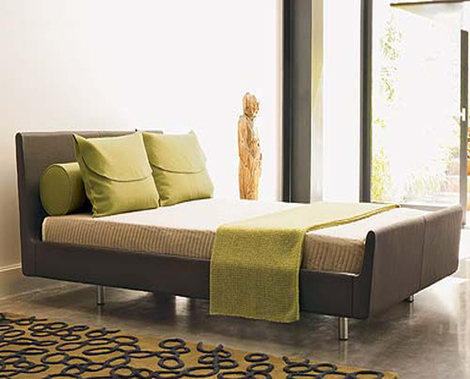 Intermingle sandy tan and adobe brown to complete that earthy, eco-friendly feel. While suitable for all areas of the home, this palette is especially good in bathrooms, kitchens and family living spaces. This is for all you designers and color enthusiats! 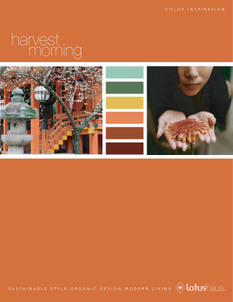 Via Hue Consulting, a blog about color, I discovered the Pantone Game and the Pantone Matching Flickr set! What fun! 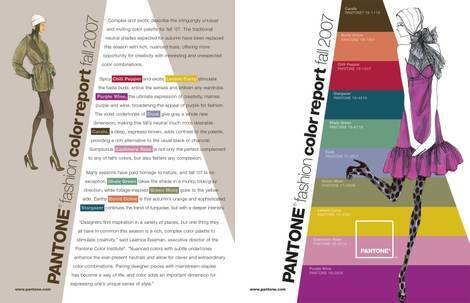 For you fashionistas, download the Pantone Fashion Color Report for Fall 2007 here. Below are a few images from the report. Utterly Engaged } E-zine. Inspring Budget Savvy Brides with Style. You've finally come across a global lifestyle blog designed to enliven your inner space! In global, modern and sustainable style, this Seattle-based blog is a place for creative design and innovation, as well as discovery and reflection. Join me as I create a collage of flowers, tea, gifts, gardens, inspiration, interiors, decor, design, entertainment, fashion, fusion, global culture, retail, merchandising, textiles, self-fulfillment, spirituality, sustainability, peace of mind and zen. I hope that you will find your time spent here inspiring and meaningful! Click on the pond to drop in fish food! Thanks!